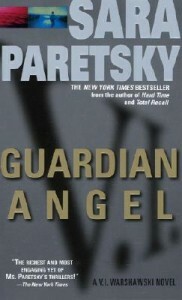 Guardian Angel by Sara Paretsky is, at least, entertaining, and that’s all it pretends to be. Oh, Paretsky’s protagonist, private investigator V.I. Warshawski is a liberal sort, and goes on the rampage against corporate raiders, junk bond dealers, and racism (although not, oddly, the male chauvinists who ALL call her “girly,” for some reason), but that’s about as deep as this story gets. The plot threads are all connected–VI’s neighbor Sal wants her to help find out what happened to his old pal Mitch, which means she’s nosing around the premises of an old-time Chicago industry; meanwhile, someone is harassing another of her neighbors; and her ex-husband is, apparently mixed up in both problems. It’s pretty normal detective stuff (although the body doesn’t show up until fairly late in the game, which, as I understand it, is pretty unusual). Not great literature, but it was a pleasant listen in the car. Sarah Paresky has never been a favorite of mine and I listen to lots of books on cd but haven’t picked hers up to read in a long time. For this kind of book, I prefer Michael Connolly, Robert Crais, John Sandford, Lee Child (sometimes quite a bit over the top) and James Lee Burke. Connolly is the most consistent and Burke can write some of the best prose I’ve read. Other authors terrific for listening are Allen Furst, Daniel Silva, some of Elizabeth –dang–can’t remember her last name–whose prot–oh George. Then there’s Ian Rankin too. Wow not many women on my list. I’ll need to figure out why.